Come see the powerful Steel Fabrication Management Software – STRUMIS, which can deliver efficiencies, increased productivity at India Steel 2013 Exhibition and Conference. This year, STRUMIS LTD India is delighted to be exhibiting at India Steel 2013 exhibition and conference from 11-13th April, at the Bombay Exhibition Centre, Mumbai, India. India has emerged as one of the largest steel producing nations in the world - according to recent figures released by World Steel Association in April 2011. India Steel is a benchmark in showcasing steel products and equipment for the construction and building sectors and other related industries. This event will allow AceCad Software India to showcase the latest solutions for efficient structural steel fabrication management. 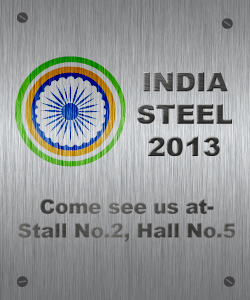 Why attend India Steel Exhibition and Conference? This event provides a platform to all the Participants, Delegates, Business Visitors and other key decision makers from the Steel and other related industry to interact with, and explore new business avenues. What will you see on our stand?